Two unexpected failures of power plants in Texas brought the state power grid to its knees during the massive winter storm that hit at the beginning of January. Back when the US was building its infrastructure (over a century ago), our technology was on a centralized power kick: It was far cheaper, easier and more efficient to build one big power plant and send its power across the lands via wires, versus putting smaller power plants on every other block. Made sense. But today, we are hugely dependent on power for everything we do, and we’re using more of it than ever, putting severe strain on our energy grid. And in today’s world of terrorists, 100-year weather events every 2 years, fracking-induced earthquakes and ancient, ready-to-fail equipment, putting all our eggs in one basket just doesn’t make the sense it used to. The time has come for the US to decentralize its power grid, and start taking advantage of modern technology to allow every home to power itself. Centralized power, with all its upsides, has incredible downsides when it goes bad. Not only can bad weather conditions cause widespread failures—and thanks to climate change, our weather is getting worse every year, severely taxing our systems—but the centralized power plant is a single-point target for regional disruption, making them military targets. Even more serious, our power grid is so interconnected in a fragile web that losing even one node can create a cascade failure that overloads and takes down plants that provide power to multiple states. Terrorists are already probing our nation’s networks, seeking ways to shut down our power grid. This is a system that’s no longer safe to depend on; it’s only a matter of time before our power systems get “hit” by terrorists, enemy attackers or just plain catastrophic weather, leaving us all in the dark and bringing life and business to a standstill. 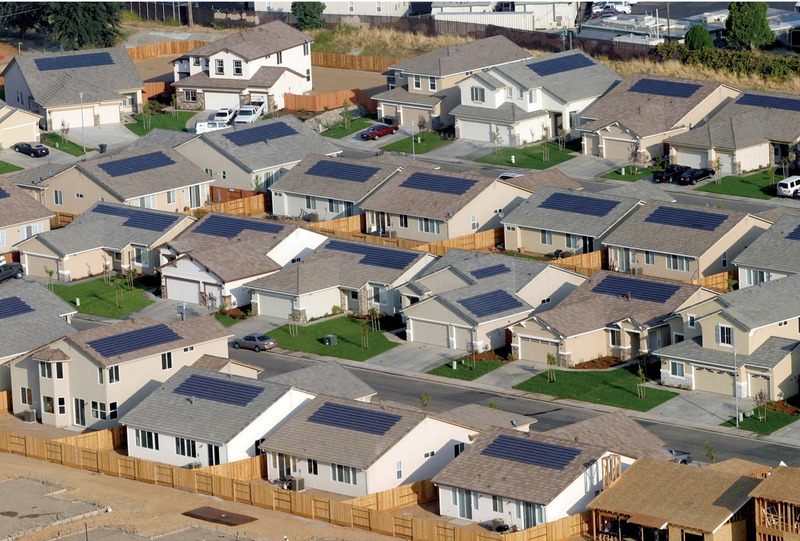 A subdivision of homes outfitted with photovoltaic panels for energy generation. But we are now in the position of being able to evolve our power network into a smarter, decentralized system that will be more sophisticated and far less vulnerable to attack. Using today’s photovoltaic products, which are now cheap enough to install on the property or the roof of almost any home, we can start producing enough electricity to supply an individual home’s daily needs. Solar power has become the primary technology making individual power systems workable. Other power generation technologies include wind and water power, if you have adequate access to wind and water sources. Where possible, a single home can combine as many of these as are convenient. The other technology that makes these individual power systems workable is battery technology, which is similarly evolving in storage and cost, and perhaps represents the real decentralized power game-changer. 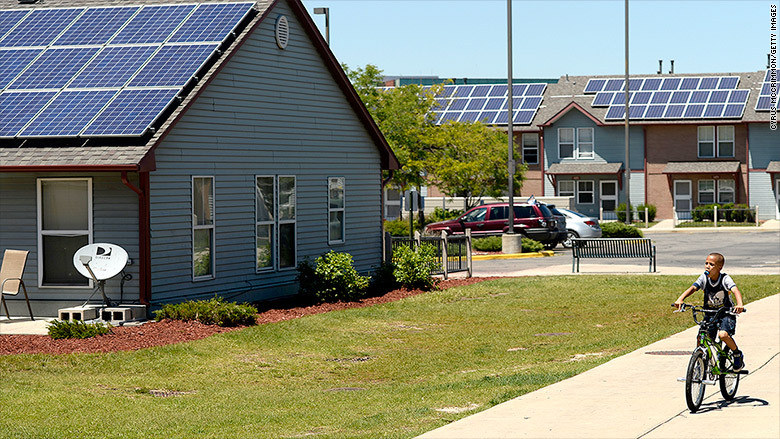 A rooftop solar panel, for instance, can generate significant power and store it in the battery during the day when no one is home; then the battery will release that power later, when the family returns from work and school. Individual buildings and homes can meter their need for power and storage on an individual basis, and excess or waste power generation, transmission loss (as heat) and consumption is lessened. And in cases where individual home power generation is still not effective, small community systems can still be constructed and shared by small groups of homes or businesses. At the very least, each home can still have a battery, storing power until needed during a blackout or other emergency. These systems can make homes and businesses their own power generators, and less (or no longer) dependent on the centralized grid for day-to-day power. Imagine hearing on the news that a terrorist act or a sudden flood has managed to disable your power company’s local plant; yet, your house is still powered, perhaps running off battery power, enabling you to hear the news, or take whatever appropriate action to be safe. Businesses can still operate, having access to their own digital data, or make unhurried plans to shut systems down safely and properly. Power is still there where needed. 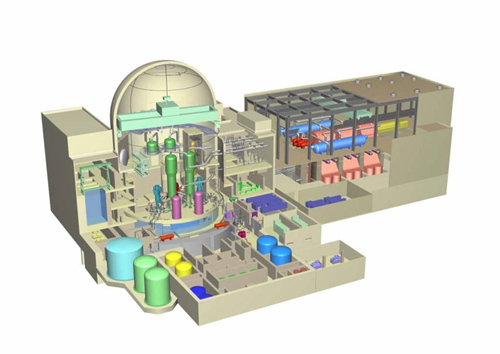 Layout of a thorium-fueled nuclear power plant. Decentralization would reduce the need for new power plants, especially coal and nuclear plants that aren’t very popular in populated areas. In some cases, ageing and soon-to-be-decommissioned plants can be replaced by smaller power systems designed to augment the local power grid, as opposed to having to provide all of the grid’s power. Being able to use smaller plants will make it feasible to apply alternative technologies to power plants, such as solar, wind, tidal and geothermal systems; as well, we can replace our first- and second-generation plutonium-fueled nuclear plants with safer, cleaner thorium plants. Decentralization would go a long way to improving our environment through the lessened use of dirty technologies powering our grid. Finally, there would be significant retooling of the network itself; but that’s better done by the owners of the infrastructure than outside organizations that won’t know the system as well. All that solar panel installation and support would also make for a great nationwide work program, proving a lot of jobs and cutting down on national unemployment. Today the benefits of decentralized power generation outweigh the benefits of centralized power, perhaps for the first time since the start of the Industrial Revolution. The US can put its people to work and roll out solar panels for every home, putting us on a fast-track to power decentralization, and we should start immediately, in the name of home (and Homeland) safety and security. Next Next post: The unthinkable has happened.